AURORA, Colo. -- Della Curry is out of work -- and unashamed -- after being fired by a school district in a Denver suburb. A married mother of two, Curry is the former kitchen manager at Dakota Valley Elementary School in Aurora. 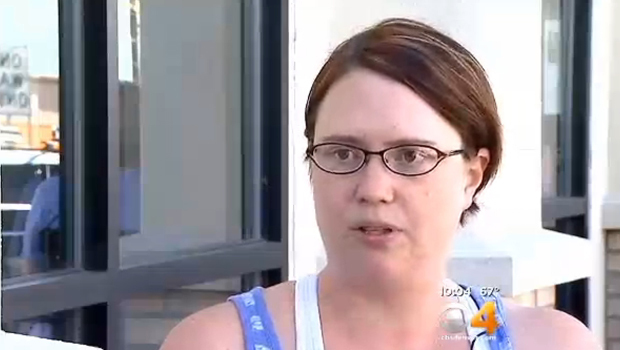 She lost her job on Friday after giving school lunches to students who didn't have any money. "I had a first grader in front of me, crying, because she doesn't have enough money for lunch. Yes, I gave her lunch," Curry told CBS Denver station KCNC-TV. In the Cherry Creek School District, students who fail to qualify for the free lunch or reduced lunch program receive one slice of cheese on a hamburger bun and a small milk. According to Curry, that meal is not sufficient. She said she often paid for students' lunches out of her own pocket. "I'll own that I broke the law. The law needs to change," she said. To qualify for the free lunch program, a family of four would have to have a household income of around $31,000. To qualify for a reduced lunch, the threshold is below $45,000. Curry said the students she helped did not qualify for either program. "Kids whose parents make too much money to qualify, but a lot of times they don't have enough money to eat," she said. Parent Darnell Hill told KCNC-TV Curry had helped out his son when he forgot his lunch money. "Do something different than fire her," Hill said. "She's trying to help." Curry said she understands the school district was just following policy when it fired her. Now she's hoping her story will lead to some changes. "If me getting fired for it is one way that we can try to change this, I'll take it in a heartbeat," she said. The Cherry Creek School District said they cannot comment on personnel issues, but said "anyone who has ever been terminated has violated some kind of written policy." Curry acknowledges that did happen in her case, but said she is looking forward to addressing the school board about making changes in the lunch policy. The law does not require the school district to provide the meal to children who have forgotten their lunch money, that is a district decision. According to our practice, we provide hot meals to students the first three times they forget their lunch money and charge their parents' accounts. The fourth time, we provide a cheese sandwich and milk. The district has worked to keep lunch prices low and still meet the federal nutrition requirements. The costs of our lunch program are not covered by the prices we charge. At the end of the year, any unpaid accounts revert back to the general fund which also covers instruction, security, building maintenance and overall operations.